Dale Ramsay, CRSS, Director, Intramural Sports. Dale Ramsay, CRSS, Director Intramural Sports. BS in Physical Education from Keene State College in 1980 and MAT from the University of Louisville in 1982. Dale was a Graduate Assistant 1980-82 and Assistant Director 1982-83 before being named Director in 1983. 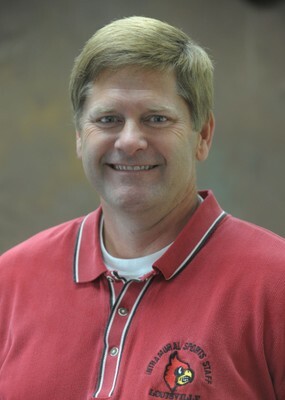 Dale was also Spirit Group Director (1992-98) and Director of Student Activities (2004-07). Dale also performs a number of duties for the Dean of Student’s Office. He is responsible for administering the university’s Speech and Literature Distribution program. Since 1984, Dale has also served as a part-time faculty member for the School of Education/HSS Department. Professionally, Dale also served as Conference Host for the 1997 and 2006 NIRSA National Conferences as well as hosting eight state workshops. He has served as a program consultant to seven different colleges and universities. Dale has received a university Outstanding Performance Award and in 2015 he received the NIRSA Region 2 Award of Merit. Dale is also a high school basketball and field hockey official working several state championships in both sports. Dale was awarded the Kentucky High School Athletic Association Outstanding Official Award in Basketball (2006) and Field Hockey ( 2000). John Smith, CRSS Assistant Director, Memberships, Marketing, Promotions, Technology, Safety. BS in Recreation Administration from Eastern Kentucky University in 1979 and MS in Recreation Administration from Eastern Kentucky University in 1980. John is a National Federation Football official who was selected to work the 2000 Kentucky State Championship game. He is also a NCAA Volleyball official, serves as Supervisor of Officials for Fast Pitch Softball and Volleyball for over 40 area high schools. In 1995 John received the Most Outstanding Volleyball Official award from the Kentucky High School Athletic Association. In 2006 he received the Outstanding Sports Supervisor award from the the same KHSAA. John is a certified instructor in Heartsaver CPR, AED Use and First Aid as well as Basic Life Supprt for Health Professionals for the American Heart Association. Prior to coming to UofL in 1987 John was the Assistant Director of Athletics for the Lexington Fayette Urban County Government. John received the Outstanding Alumni Award from Eastern Kentucky University in 1995. 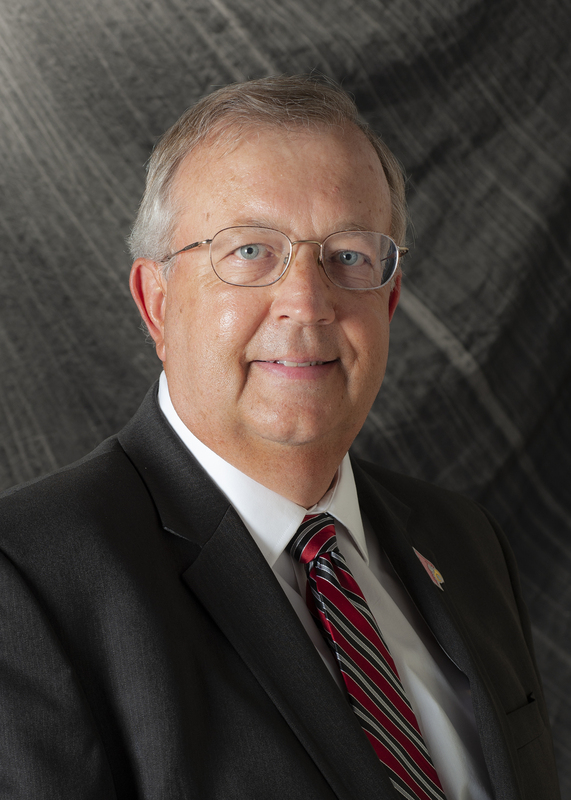 John is currently the Chair of the University of Louisville Staff Senate and is a member of the University of Louisville Board of Trustees as well as the University of Louisville Foundation Board of Trustees. David Hatfield, Associate Director, Facility Operations. BS in Recreation Education from University of Louisville in 1985, MAT in Physical Education from University of Louisville in 1988. David worked as a G.A. for the department from 1986 - 1988 and after graduation David was the Program Director at a private health and fitness club for two years prior to returning to the Intramural Sports Department. David has served as lead facility operation director for the department since 1994. He has directed and maintained facility operations for Crawford Gym, Crawford Pool, Carmichael Gym, Humana Gym, SAC Recreational Center and the Student Recreational Center. Professionally, David has been a member of NIRSA and KIRSA for the past 29 years. He also assisted in hosting the 1997 and 2006 NIRSA National Conferences. In 2010, David received the University Outstanding Performance Award. David’s proudest professional accomplishment was assisting with the development, designing, construction and implementation of the new Student Recreational Center. Prior working for the department, David was a former standout football player for the University of Louisville, David lead the team in receptions and yards as well as being one of the nation’s top ten receivers his senior year. Outside interests includes traveling, golfing and staying active with his wife, Connie as they look forward towards retirement together. .
David Rice, Coordinator of Sport Clubs and Facilities. BA in English from the University of Louisville 1997, MS in Recreation Management from Western Kentucky University 2000. David worked at Georgia College & State University for a year before returning to the University of Louisville in 2001. He oversees the comprehensive Sports Club program, which has seen incredible growth in recent years, including conference championships from the Ice Hockey, Men's Rugby, and Men's Lacrosse Clubs, as well as the Men's Volleyball Club winning the Division II National Championship in 2018. His other duties include scheduling all areas of Student Recreation Center, overseeing the departmental membership program, assisting with management of the Intramural Sports Office, and various special projects. Outside of the University, David is an avid sports fan, with a particular interest in golf, as well as interests in gaming, reading, and spending time with his wife Cathy and their two daughters, Samantha and Charlotte. Debby Woodall, CRSS, Assistant Director, Fitness and Wellness Programs. Debby earned a BS in Sports Administration from the University of Louisville in 1991 and Master of Physical Education with an emphasis in Fitness/ Wellness from U of L in 1994. Debby served as a graduate assistant in the Intramural & Recreational Sports Department from 1992-1994 prior to joining our staff full time in 1996. She has been a Certified Personal Trainer with ACE (American Council on Exercise) since 2001 and worked in the Corporate Fitness field and the YMCA before returning to U of L. Debby is passionate about youth sports and has coached various sports teams for her children through the years. Debby enjoys running, watching and playing just about all sports and doing anything outdoors. Justin Peterson, Assistant Director of Intramural Sports. Originally from Grand Rapids, Michigan, Justin completed his undergraduate degree at Central Michigan University with a major in History and Social Sciences. While at CMU he served as an official and supervisor in the Intramural Sports program. He then attended Indiana State University where he was a graduate assistant in the Department of Recreational Sports and received a degree in Recreation and Sport Management. Justin is a KHSAA basketball official. He also served as KIRSA State Director from 2016-2018. Justin also has developed a strong relationship with Special Olympics Kentucky and has started a Unified Sports program on our campus. Justin is an avid sports fan and in his free time he enjoys watching and playing sports. Karen Zody, Administrative Assistant. Karen has been with the University of Louisville for 10 years, starting at the Student Counseling Center and then transferring to the Intramural Sports Department. Karen completed the University Business Procuring Sub-Certification Program as well as other numerous University Business Office Trainings. She brings 35 plus years office experience including 4 years in Athletics at Christian Academy of Indiana and several years teaching Dance Lessons at Indiana United Dance. Karen has been on the U of L Student Affairs Professional Development Committee for 8 years. Karen loves interacting with the students, faculty, staff and members of the SRC. Outside of work she enjoys campfires, vacations, and spending time family and friends. Frank Nuxoll, Facility Supervisor, Student Recreation Center. BS in Physical Education with a concentration in Sport Management from the University of Louisville in 1988. Frank is an active volleyball, golf, cyclist, and outdoor enthusiast. He is a former NCAA volleyball official and still serves as a KHSAA official working matches for many area high schools. He has served as an observer for two NCAA Division I Volleyball Championship first and second round contests. Frank also serves as the voice of the Pirates serving as broadcaster for Charlestown High School Volleyball broadcasts. He is a Volunteer assistant coach for Pirate Volleyball where his wife, Tammy, is the head coach. They have two children, Nick and Maddie. Greg Johnson, Facility Supervisor. Greg comes to the Intramural Department after 6 years in the university's Physical Plant where he was in charge of the Swain Student Activities Center. Greg was honored with a special award in recognition of his outstanding contributions to the physical condition of the SAC at the 2000 Intramural Awards Ceremony. Greg has two sons, Gregory and Malik. Greg enjoys weight training and conditioning in his free time. He is active in a number of volunteer roles through his church, St. Johns AME. Tim Lynch, Facility Supervisor, Health Science Campus Fitness Center. Tim has been on staff as a Sports Facility Supervisor at the Health Science Campus Fitness Center since its' opening in January 2002. Tim worked as an under-graduate Intramural Sports Supervisor from 1992-94. From 1995-98 he served as the evening facility supervisor for the Ohio Valley Volleyball Center. He has coached volleyball at DuPont Manual and Holy Cross High schools as well as winning a State Championship with Assumption High School in 1999. Tim worked as an Education Trainer for Humana Health Insurance Co.in Louisville from 1999-2001 before returning to the Intramural Department. Tim was also the the Co-Head Coach for the Women’s Volleyball team at Bellarmine University and was on staff for the University of Louisville Women’s Volleyball team (2003). Tim received the prestigious Outstanding Performance Award from the University in 2015. Justin Lucas, Facility Supervisor, Health Science Campus Fitness Center. Justin earned his BS in Sport Administration from the University of Louisville in 2011 and was a recipient of the Most Outstanding Undergraduate Student in Sport Administration Award. During his undergraduate career at U of L, Justin worked in the Intramural Sports Department as a student worker and undergraduate facility supervisor, as well as serving as an equipment manager for the UofL football team. After graduating, Justin worked for Louisville Metro Parks Athletics as a League Coordinator from 2011-2013 and at the Kentucky State Reformatory as a Recreation Leader from 2013-2015. Justin enjoys attending UofL sporting events and spending time with friends, family, and his dog, Bean. Carolyn Meiman- Departmental Assistant (Facilities) Carolyn graduated from UofL with a BA in Psychology and a Minor in Sociology. Currently she is pursuing a MSSW at the Kent School of Social Work. She coaches girl's volleyball at Atherton High School and at Mid-American Volleyball Association. Carolyn worked for the Intramural Department as an undergraduate and continues for her graduate studies. DeShaela Rivers, Sport Program Assistant, Fitness DeShaela is a graduate from Eastern Kentucky University where she earned a B.S. in Health Sciences. During her time at EKU she worked for Campus Recreation as a student supervisor, group fitness instructor and personal trainer. She trained a variety of athletes such as, basketball, football and volleyball players. 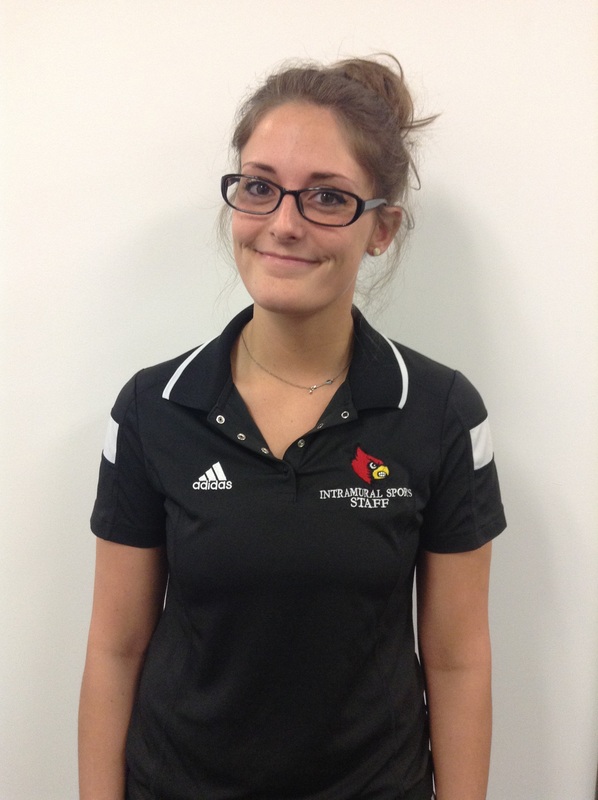 She is currently working towards pursuing a Masters in Sport Administration at the University of Louisville. DeShaela is very passionate about spreading her knowledge to help others live a healthier and more active lifestyle. She enjoys running, calisthenics, being outdoors and watching football. Kat Halbleib- Sport Program Assistant (Intramurals) Kat graduated from the University of Louisville with a Bachelors in Sport Administration in 2017. During her time as an undergraduate she worked for the Intramural Department as an official and eventually an Intramural Supervisor. She is currently pursuing her Masters in Business Administration at the University of Louisville. Not only does Kat work for the Intramural Department at UofL she also coaches high school girls lacrosse. And in her spare time enjoys running, playing recreational sports, and officiating basketball. Christina Franck- Sport Program Assistant (HSC Fitness Center) Christina graduated in May 2017 with her Bachelors of Science in Sport Administration from the University of Louisville and is beginning pursuit of a Masters degree. During her undergrad years she was an active member of Kappa Delta sorority and UofL Club Lacrosse. She also completed internship with CMG Sports Agency, the Kentucky Derby Festival, UofL Field Hockey and the Youth Baseball Nationals. In her spare time Christina officiates high school girls lacrosse and loves cheering on the Cards. Chris Colborn- Sport Program Assistant (Fitness) Chris graduated from the University of Louisville with a B.S. in Health and Human Performance with tracks in Exercise Science and is currently working towards a career in Physical Therapy. He is a Certified Personal Trainer through ACE and enjoys working with clients to strive for a healthier lifestyle. He is very passionate about health and fitness, enjoys strength training, golf and competing in natural physique competitions.